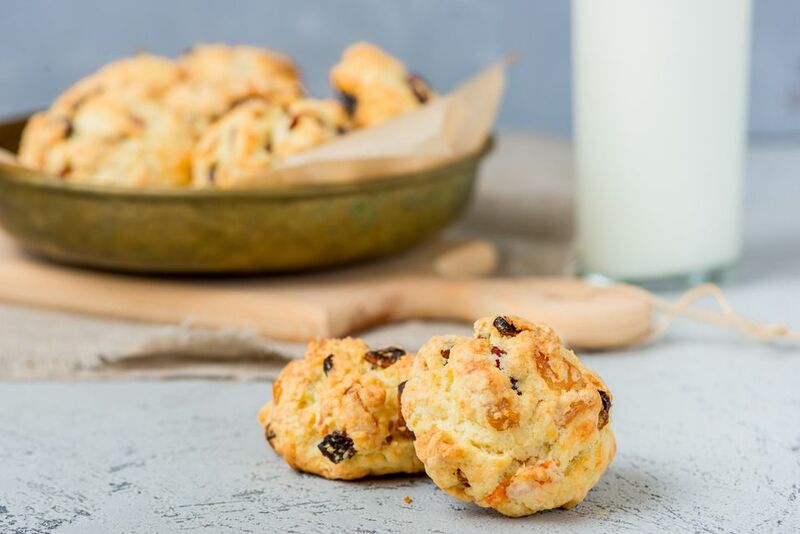 Rock cakes are simply the easiest British bake to make; they are so easy, anyone can make them. Children love to make them too; from start to finish they take no time and this recipe is pretty foolproof, so there is a great sense of achievement as you take them out of the oven. In a flash, they are on the plate, all warm and ready to be eaten. Children also have a fondness for rock cakes as they also happen to be one of Harry Potter's favorite tea time treats. Rock cakes are also known as rock buns, depending on where you live in the United Kingdom. The recipe, however, is always the same. Sieve the flour and baking powder into a large baking bowl, add the softened butter or margarine, and lightly rub together with fingertips until the mixture resembles fine breadcrumbs. Add the egg and 1 tablespoon of the milk and mix to create a stiff dough. If the mixture is still dry, add milk a tbsp at a time until required consistency. Using a tablespoon, divide the mixture into 12 mounds evenly spaced on the 2 baking sheets. Sprinkle with the demerara sugar. Bake in the preheated oven for 15 mins or until golden brown and well risen. The rock buns should be firm to the touch, but they harden up properly once cold. Dried cranberries (craisins) made a good addition, as do a few chopped nuts, a teaspoon of honey, or a few chocolate chips added in just before cooking. Some reviewers have suggested adding a teaspoon of mixed spice. Try both and see which you like. If you can't find mixed spice, try using pumpkin pie spice. It's a lovely substitute. Enjoy! Tea Time Treats With Easy to Make Welsh Cakes.